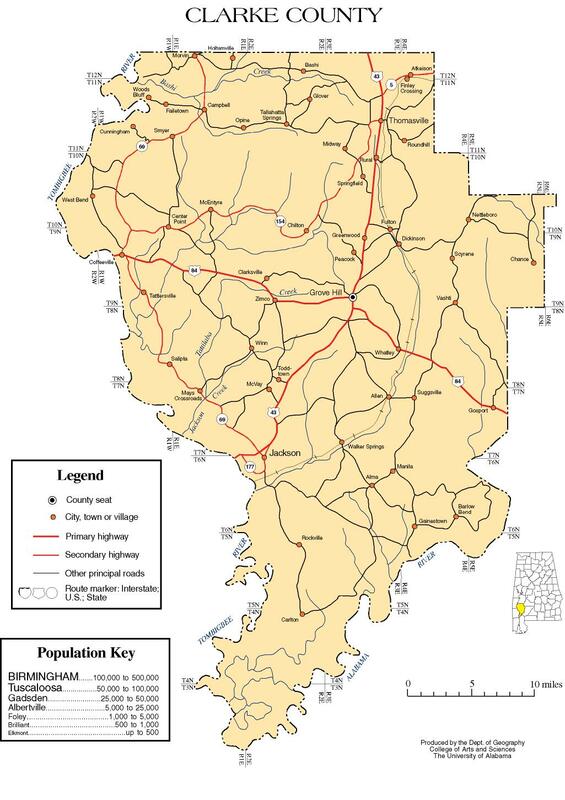 Clarke County is a county of the U.S. state of Alabama. As of the 2010 census, the population was 25,833. The county seat is Grove Hill. The county was created by the legislature of the Mississippi Territory in 1812. It is named in honor of General John Clarke of Georgia, who was later elected governor of that state. The county museum is housed in the Alston-Cobb House in Grove Hill. For thousands of years, this area was occupied along the rivers by varying cultures of indigenous peoples. At the time of European encounter, Clarke County was the traditional home of the Choctaw and the Creek people. They traded with the French, who had settlements in Mobile and New Orleans. They also were reached by some English and Scots traders from the British colonies along the Atlantic Coast. After the Louisiana Purchase, they started to establish relations with the United States. In 1805, by the Treaty of Mount Dexter, the Choctaw conveyed large amounts of land in what is now southeastern Mississippi and southwestern Alabama, including much of the western portion of Clarke County, to the United States for settlement by European Americans. Clarke County was established on December 10, 1812 by the Mississippi Territory. The county had numerous forts, built by settlers for protection during the Creek War (1813–1814). One of the most notable was Fort Sinquefield. The first county seat was Clarkesville, founded in 1820. The seat was moved to Macon, later renamed Grove Hill, in 1831. During the American Civil War, the county was notable for its salt production. In 1883, the U.S. Supreme Court upheld the conviction of Tony Pace and Mary Cox for interracial dating, in Pace v. Alabama. That precedent was subsequently overturned. In 1892, Clarke County was the scene of a violent confrontation around economic divides that later became known as the Mitcham War. Clarke County became a dry county in 1937, when wet-dry counties were established in Alabama following the repeal of prohibition in 1933. In the first decade of the 21st century, the county's largest communities voted to legalize alcohol sales: Jackson on May 10, 2005; Thomasville on August 14, 2007; and Grove Hill on November 3, 2009. According to the U.S. Census Bureau, the county has a total area of 1,253 square miles (3,250 km2), of which 1,238 square miles (3,210 km2) is land and 14 square miles (36 km2) (or 1.1%) is water. It is the third-largest county in Alabama by land area and the fourth-largest by total area. As of the census of 2000, there were 27,867 people, 10,578 households, and 7,700 families residing in the county. The population density was 22 people per square mile (9/km2). There were 12,631 housing units at an average density of 10 per square mile (4/km2). The racial makeup of the county was 55.94% White, 43.02% Black or African American, 0.22% Native American, 0.16% Asian, 0.16% from other races, and 0.49% from two or more races. Nearly 0.65% of the population were Hispanic or Latino of any race. There were 10,578 households, out of which 35.40% had children under the age of 18 living with them; 53.90% were married couples living together, 15.70% had a female householder with no husband present, and 27.20% were non-families. Nearly 25.50% of all households were made up of individuals, and 11.90% had someone living alone who was 65 years of age or older. The average household size was 2.60, and the average family size was 3.13. In Clarke County, the population was spread out, with 28.00% under the age of 18, 8.50% from 18 to 24, 27.50% from 25 to 44, 22.50% from 45 to 64, and 13.50% who were 65 years of age or older. The median age was 36 years. For every 100 females, there were 89.70 males. For every 100 females age 18 and over, there were 84.60 males. The median income for a household in the county was $27,388, and the median income for a family was $34,546. Males had a median income of $34,111 versus $19,075 for females. The per capita income for the county was $14,581. About 18.10% of families and 22.60% of the population were below the poverty line, including 29.60% of those under age 18 and 23.80% of those age 65 or over. ^ a b "Clarke County: A Brief History". Clarke County Historical Museum. Retrieved January 3, 2009. ^ Finlay, Louis M., Jr. (Summer 2000). "The Mitchell Reserve". Clarke County Historical Society Quarterly. 25 (1): 9. ^ "Fort Sinquefield". Clarke County Historical Museum. Retrieved July 27, 2011. ^ "Mitcham War". Encyclopedia of Alabama. Retrieved August 6, 2012. ^ a b Evan Carden (May 12, 2005). "'Yes' to Jackson alcohol sales". The South Alabamian. Retrieved July 24, 2011. ^ Arthur McLean (August 16, 2007). "Thomasville goes wet". The Thomasville Times. Retrieved July 24, 2011. ^ Connie Baggett (November 3, 2009). "Voters in Grove Hill approve sale of alcohol inside city". Press-Register. Retrieved July 24, 2011. Clarke County map of roads/towns (map 2007 Univ. of Alabama). This page was last edited on 5 September 2018, at 22:24 (UTC).